Hanford and her team set out to engineer a metamaterial that can allow the sound waves to bend around the object as if it were not there. 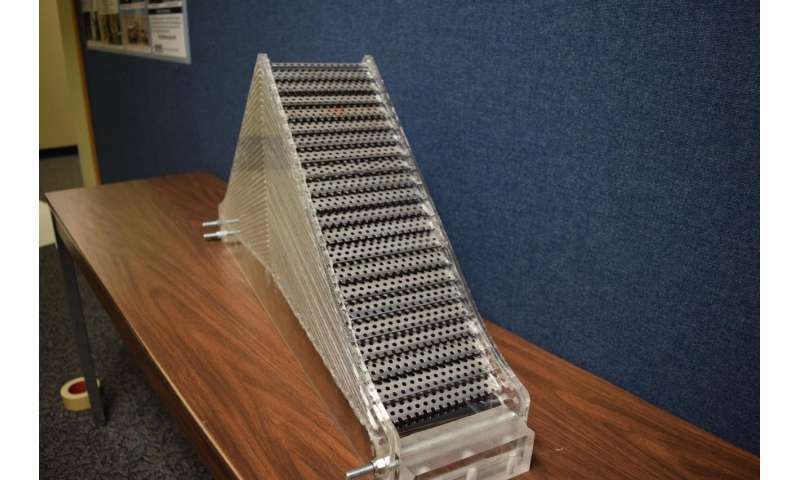 Metamaterials commonly exhibit extraordinary properties not found in nature, like negative density. To work, the unit cell—the smallest component of the metamaterial—must be smaller than the acoustic wavelength in the study. "These materials sound like a totally abstract concept, but the math is showing us that these properties are possible," Hanford said. "So, we are working to open the floodgates to see what we can create with these materials." I want this cheese grinder! Can this hide a submarine? From active searching i.e. a pinging sonar, that would seem to be the point. But that says nothing about passive detection of disturbance caused by the submarine itself. I'm not sure that adding a layer of this across a submarine would reduce its noise profile, I would quess quite the opposite. Where it could be very dangerous is as a coating for sea mines. Submarine acoustic stealth is already so sophisticated and they now have the problem of creating a dead zone in the water. They were being detected not because they made noise, but because they didn't make noise. Any given volume of water should have some sort of acoustic profile. So they had to start emitting fake wave noise to simulate what was missing. Meaning... there is no point to this as far as submarines go. They're already acoustically invisible.